Jacqueline was awarded the Bar Scholarship and Charles Ching Memorial Scholarship in 2013. She is developing a broad civil and commercial practice in line with Chambers’ profile with experience and interest in company and insolvency, trust and probate, land, intellectual property, insurance, employment and shipping law matters. Within her first year of practice, Jacqueline had acted as sole advocate in a 5-day arbitration concerning a US$20 million claim for breach of shareholders’ agreement. In 2018, she also acted as sole advocate in a HKIAC arbitration for a law firm to claim for outstanding legal fees against former client. Since joining Chambers in 2014, Jacqueline has appeared led or as sole advocate in trials concerning claims of undervalue transactions, common intention constructive trust, adverse possession, loss of cross-border vehicle licence, torts of maintenance and champerty, and ownership of properties (land and company shares). She also acted as defence counsel (as sole advocate) in a criminal trial at the Magistrates Court relating to breach of Noise Control Ordinance (Cap. 400). Jacqueline has experience in handling contested interlocutory applications involving default judgment, summary judgment, stay of proceedings, specific discovery, expunge of documents, charging order, striking out, expert evidence and injunctions. Jacqueline also has a particular interest in matrimonial practice. She has provided advice and representation to husband, wives and separating unmarried parent in matters ranging from variation of maintenance orders (interim and final), enforcement of undertakings, application for litigation funding, avoidance of disposition, to preliminary issue trial on the ownership of matrimonial home and financial provision for children of unmarried couples. 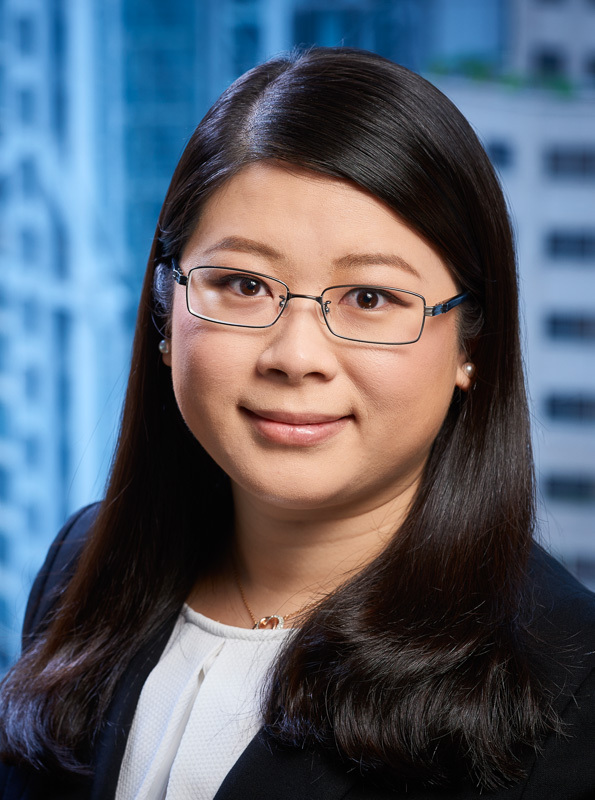 Jacqueline is a contributing editor of Hong Kong Civil Procedure and has delivered CPD Seminars on family law, planning law and the law of unjust enrichment. Before pupillage at DVC, Jacqueline graduated with a First in LLB from the University of Hong Kong, ranking second in her year. Following this, she received the highest marks in the PCLL Litigation Stream and the matrimonial practice course. She went on to obtain the BCL from the University of Oxford (ranking first in her Commercial Remedies class) with the support of the Sir Edward Youde Memorial Fellowship for Overseas Studies. • Hui Ki Ho v. Yeung Chun Fung, HCA 2942/2015: Trial of claim for loss of cross-border vehicle licence (pending decision); Specific Discovery; Expunge of Documents from Trial. • Zhang Xiuhong v. Liu Wenchen, HCA 2118/2012: Security for costs. • KKC Capital Limited Partnership v. Agape International Enterprise Limited, HCA 2240/2016: Charging order over convertible bonds. • FT Life Insurance Company Ltd v. Lo Kwok Wai, DCCJ 4999/2015: Summary judgment against ex- insurance agent. • Poh Po Lian v. Tong Chi Kong Jody, HCA 1280/2012 (led by Douglas Lam S.C.): Trial on the torts of maintenance and champerty. • Cheer Signal Development Limited v. Wong Siu Fan, HCA 780/2015 (led by Anson Wong S.C. and Christopher Chain): Mareva injunction up to the value of HK$127 million in relation to a fraud claim. • SBC CPA Limited v. Au Ka Man Silkie,  4 HKLRD 842 (with Jonathan Chang): Interlocutory injunction against ex-employees for breach of confidence and copyright infringement. • Great River Corp. Limited v. China NTG Gansu Gas Limited, HCMP 1967/2012 (led by William Wong S.C.): Discharge of interim injunction granted in aid of BVI proceedings. • Yong Li Investment Ltd v. Lee Sing Leung Robin, HCA 1050/2016 & HCA 542/2016: Consolidation of proceedings. • 2018: Acted for a respondent in resisting an HKIAC Emergency Relief application (led by Douglas Lam S.C.). • 2018: Acted for a law firm as sole advocate in an arbitration involving claim for outstanding legal fees against former client. • 2018: Resisting a jurisdictional challenge in a HKIAC arbitration (led by Douglas Lam S.C.). • U v. S, HCCT 1/2018 (led by Douglas Lam S.C.): Adjournment of enforcement of CIETAC Award proceedings pending setting aside proceedings in the PRC. • Fung Hing Chiu Cyril v. Henry Wai & Co (a firm); Grandom Asia Holding Ltd v Henry Wai & Co (a Firm)  1 HKLRD 808 (led by Audrey Eu S.C.): Stay of court proceedings in favour of arbitration. • Danco International Limited v. Luxe Home Limited, LDBM 180/2016: Stay of Lands Tribunal proceedings in favour of arbitration. • Arjowiggins HKK2 Ltd v. X Co, HCMP 53/2015 (with Teresa Wu): Setting aside application of an arbitral award and resisting its enforcement in Hong Kong. • 2015: Acted for the Respondent as sole advocate in a 5-day arbitration involving a US$20 million claim for breach of shareholders’ agreement, as well as interlocutory applications for disclosure of offshore company documents. • Chiu Siu Ying Betty as Administratrix v. Kwok Lan, DCCJ 3231/2017: Summary judgment for vacant possession of N.T. land. • Tierra Trading Limited v. Land Base Limited, HCMP 3074/2014 (led by Johnny Mok S.C.): Trial on adverse possession of land on Lockhart Road, Causeway Bay. • Ng Kam Kuk v. Chan Fung Chun, HCA 1432/2015: Order of sale of land under Order 31, RHC. • Re Estate of Lam Kwok Leung, Deceased, HCA 1547/2016; HCMP 2634/2016 (with Teresa Wu): Application for account and declaration of interest in landed properties under the Intestates’ Estates Ordinance (Cap. 73). • Menno Leendert Vos v. Global Fair Industrial Limited, HCA 4200/1995: Charging order over landed property. • Rightop Corporation Limited. v. Yau Wing Yan Joyce, HCMP 1209/2015: Summary disposal of claim in trespass to land. • Keymain International Ltd v. Chan Yin Fong, HCA 2618/2014 (led by Douglas Lam S.C.): Striking out application. • Tierra Trading Limited v. Land Base Limited, HCMP 3074/2014 (led by Johnny Mok S.C.): Continuation of originating summons procedure as if begun by writ. • To Pik Ha v. Lui Wai Fong, HCMP 557/2013; Lam Chi Ying v. To Pik Ha, HCA 1930/2013 (with Teresa Wu): Joint trial involving two estates and relating to the ownership of company shares. • Man Kai Tak v. 梁妹, DCCJ 1806/2010 (with Benny Lo): Trial on adverse possession of N.T. land. • Re Ricco (International) Company Ltd  6 HKC 487: Setting aside allotment of shares in a transaction contravening s.47A of the former Companies Ordinance (Cap. 32). • Wong Tak Man, Stephen v. Cheung Siu Fai,  5 HKLRD 923 (led by Robert Whitehead S.C. and Jose Maurellet): For the trustees in bankruptcy in applying to set aside multiple transfers as being transactions at an under value and unfair preferences under the Bankruptcy Ordinance (Cap. 6). • Re Joint Silver Ltd, HCCW 1/2016 & HCMP 552/2016 (led by Douglas Lam S.C.): For the Liquidators in a Petition to wind up a company already in creditors’ voluntary liquidation and replace the liquidators. • Re HIH Insurance (Asia) Limited (in Provisional Liquidation), HCCW 337/2001 (led by Douglas Lam S.C.): Winding-up Petition of insurance company. • Re T-Hero Industrial Company Limited, HCCW 403/2017: Validation orders. • Cheung Hing v. Wah Fong Forest Resources Ltd, HCMP 2433/2012: Application to commence statutory derivative actions. • Cheung Hing v. Wah Fong Forest Resources Ltd, HCMP 3/2016: Summary and/or default judgment. • Li Fei Yu v. WDI International (HK) Ltd, HCMP 2928/2014; Melvin Waxman & Anor. v. WDI International (HK) Ltd, HCMP 743/2015 (led by Douglas Lam S.C.): Application to set aside company resolutions and to convene company meeting. • LLC v. LWMA, FCMC 4683/2014: preliminary issue trial on the beneficial ownership of the matrimonial home etc (led by Douglas Lam S.C.); Variation of costs of preliminary issue trial; Litigation Funding under section 3 of the MPPO (Cap. 192); Enforcement of MPS undertakings. • FCMC 8597/2016: Enforcement of Undertakings under Consent Order. • LWYA v. KYW, FCMC 14018/2011: Issue of jurisdiction in taxation hearing of costs in preliminary issue trial. • WMY v. CSK, FCMC 17011/2011: Variation of costs after the ancillary relief trial. • Advising the Respondent husband on an application for downward variation of a child maintenance order. • Advising on an application for avoidance of disposition order under section 17 of the MPPO (Cap. 192). • Advising the Respondent father on financial provision for the unmarried couple’s daughter under section 10 of the GMO (Cap. 13). • Universal Music Limited v. Neway Music Limited (led by Wong Yan Lung S.C.): Summary judgment for copyright infringement (pending decision). • HKK v. N, HCCT 45/2012 (led by Wong Yan Lung S.C.): For a music record company in Third Party Proceedings relating to a reference to the Copyright Tribunal. • Advising a local martial arts group on infringement of its IP rights in audio and written teaching materials. • HKSAR v. Hong Kong Tramways Limited, ESS45077/2017: As defence counsel in a criminal trial of an offence under Noise Control Ordinance (Cap. 400).